Designed to offer the workman a high degree of fibreglass strength along with the comfort of a.. Designed to offer the workman a high degree of fibreglass strength along with the comfort of a pr..
Our polyfibre range of solid forged contractors tools offer the workman a high degree of polyfibfre strength along with the comfort of a profile moulded PYD handle grip. The moulded PYD handle is incredibly strong, virtually eliminating the danger of breakage and potential injury. Injection moulded polypropylene sheathing totally encloses the polyester resin fibreglass core, virtually eliminating the danger of handle breakage and potential injury. Our range of polyfibre shovels will not rot, shrink, dry out or become more susceptible to breakage through periods of inactivity. The range of polyfibre shovels includes taper and square mouth shovels, one and two way shovels and also newcastle draining tools (grafts) giving the contractor a tool for a wide variety of applications. 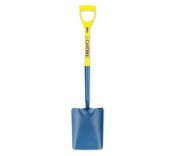 We have recently added to our range of polyfibre shovels a range of Safe Dig polyfibre shovels. The purpose of the Safe Dig polyfibre shovels is to reduce the risk of penetrating hidden cabling. It does this by incorporating a double thickness leading edge on the blade. These Safe Dig polyfibre shovels are to be used as part of a safe working practice when potentially live underground services may be present.